There’s not a better way to get your day started than with a brand new image of an Optimus Prime toy from Transformers: Age Of Extinction! 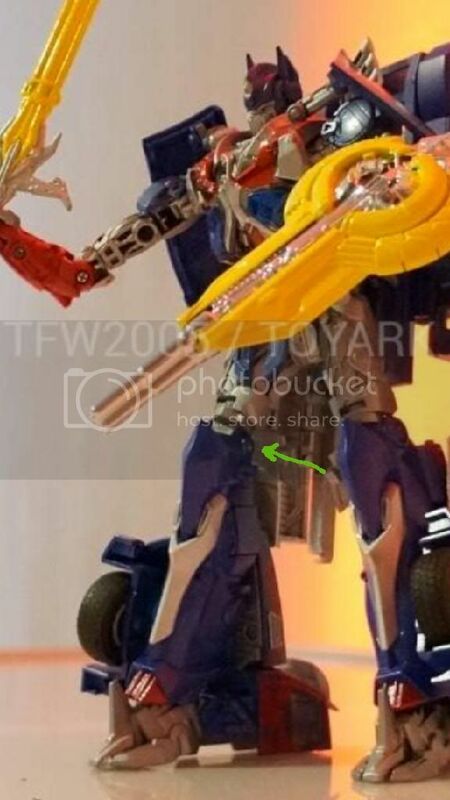 Courtesy of TFW2005 board member, yizhi521, we have what appears to be a leaked image of an Optimus Prime toy from the new live action film. At this time we only have the one image with the original source being unknown; we are unsure where the leak originated. It does appear to be different from the previous Optimus Prime toy revealed at this year’s New York Comic Con. Is this a new Leader Class figure? Voyager? Check out the image after the jump and sound off on what you think of this reveal! Does anyone else think that this is similar to the recently revealed FE Optimus Prime? I remember seeing a couple of reviews for the "Leader Class" Optimus at NYCC, and people who saw it in person said it was really small for a leader class figure. But I'm not worried about that figure anymore. This new one looks tons better, and I'm totally convinced that it's bigger than the NYCC Leader. Though I am kinda worried that Grimlock toy's size will be kinda like DOTM Ultimate Optimus Prime(the one with the trailer that turns into wings), just cause the movie Grimlock is so gigantic. But we haven't seen any pics or info about that, I just have a feeling. My Hasbro contact. He says the leader toy that was shown is small compared to past leader toys. I'm really hoping that its a LE leader like how we got the LE wave for Prime before they switched over to the RID line. If the Leader Class are something like the Weaponizers I just hope Grimlock is longer in Trex mode. What if the NYCC Leader is some sort of preview wave? Happened with the Prime figures too. What if what they showed in NYCC was more akin to a weaponizer figure, like bee and prime from TF Prime? Jesus, guys. Yes, I'm sure Hasbro is (for some reason) lying about the NYCC OP being a Leader. 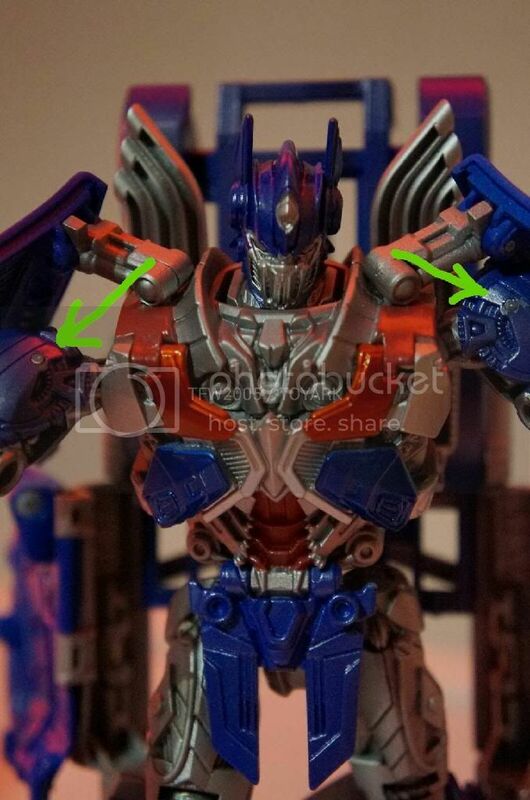 Here are some reasons why I believe that the new pic is the real Leader Optimus. All the movie leaders I own have ratchet joints on the shoulders, elbows, hips, and knees, which require a screw on one side of the joint. 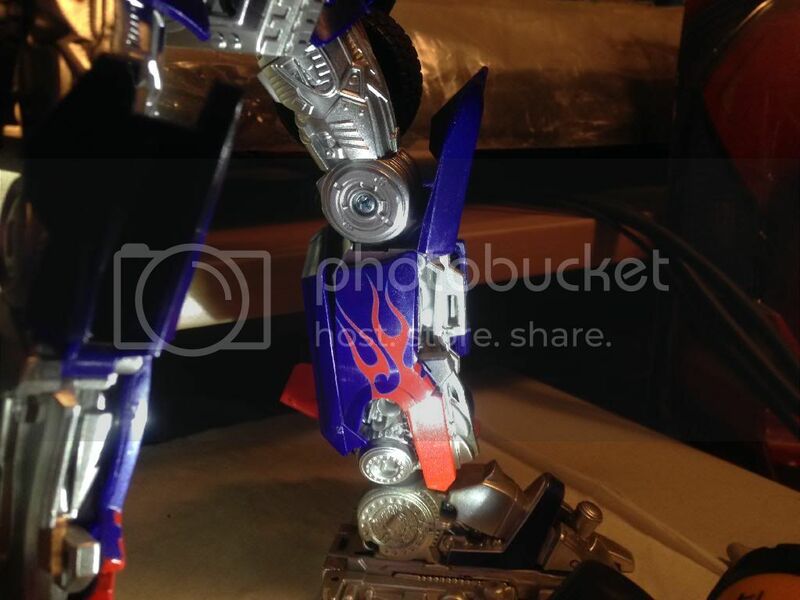 Like these 2 pics here of my aps-01 Optimus. 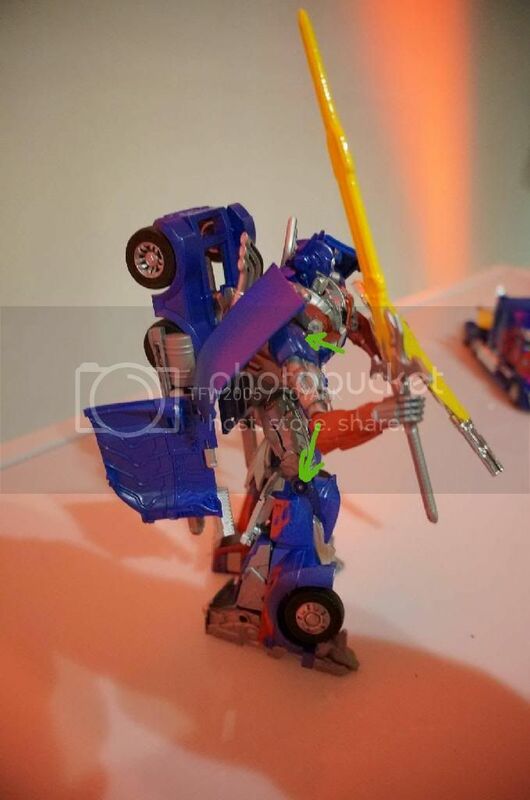 This new Optimus appears to have the thicker arms and legs that are required for ratchet joints. 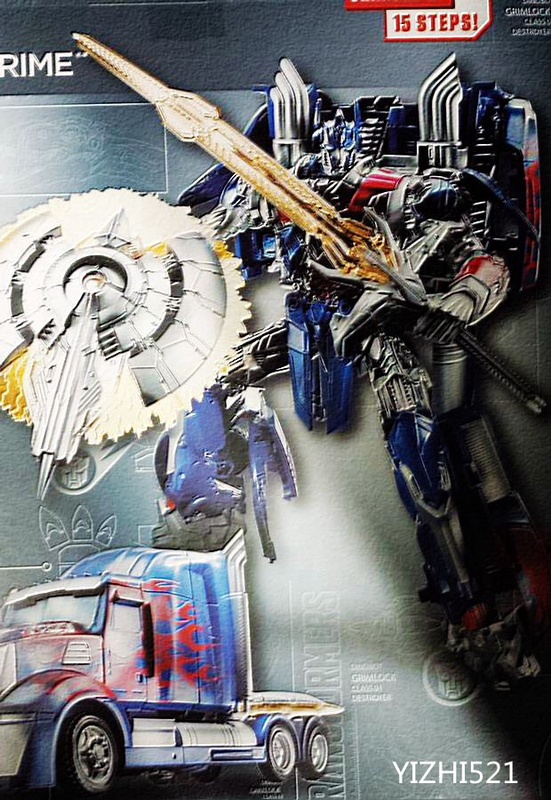 And to me, the transformation looks very similar to the ROTF/DOTM Optimus. The other "leader" they revealed a few months ago has the cheaper pin joints in the shoulders and knees. The inner knee is just the other side of the pin, no screw. And although the elbow joint has a screw, it is clearly not thick enough for a ratchet joint. Huh. Those are good points. Good job at spotting them. Yeah, that's my exact theory as well. It seems like Hasbro always sends someone who doesn't know or care much about what they're displaying. Honestly…I wouldn't put it past them. Wait? Do you know something we don't? No. Again i just have that feeling. Thanks for pointing it out, no one would believe this is a Leader Class. Does anyone think Yizhi works for a toy company/factory and that he's getting the info from them? I think he's right the joints are much thicker.